Learn how to make an electromagnetic projectile launcher without a camera. In this DIY, you'll learn how to make a coil gun without a camera. A coil gun is an electromagnetic projectile launcher. It's more powerful sibling, the Rail Gun is already being tested in military applications. It is also one of the most powerful weapons in the Quake game series. Coil guns are so powerful that they are going to be utilized to launch satellites into orbit in the future! 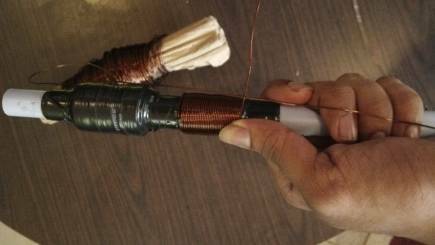 These instructions will show you how to make your own coil gun without a camera circuit. Have fun with this DIY hacking tutorial! How Does the Coil Gun Work? A coil gun consists of a series of conducting coils arranged along a straight line spaced apart from each other. When current passes through the coils, it induces a magnetic flux through their centers. As a ferromagnetic projectile approaches the magnetic flux lines created by the coil, it gets magnetized and the magnetic attraction pulls the rail towards the center of the coil. The series of coils are arranged so the magnetic flux from the first coil pulls the projectile towards its center. After that, the first coil is switched OFF and the second coil is switched ON, which again pulls the projectile towards its center. When this process is repeated through a succession of coils, the projectile can reach tremendous velocities. 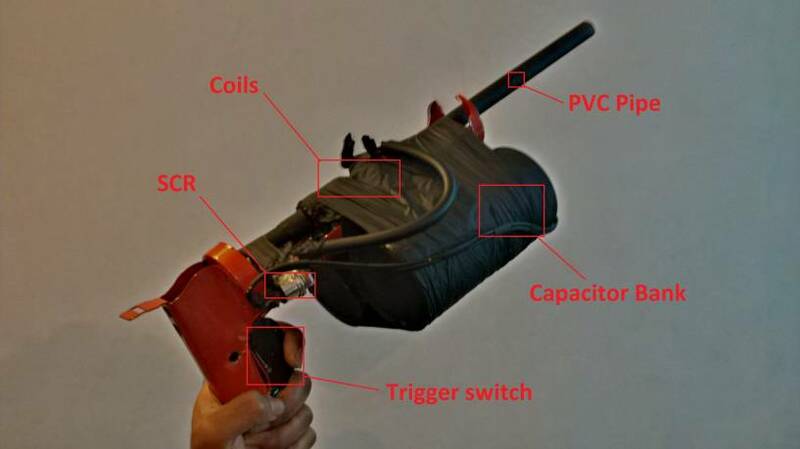 Before we get started, keep in mind that a coil gun involves working with high voltages and fast moving projectiles. Only people who know how to handle high voltages safely should make one. Also, I am not responsible for any injuries or harm that may be caused while working on this project. Proper insulation of all contacts and terminals should be done and safety gear such as rubber gloves, shoes, and safety glasses should be worn at all times. Take the PVC pipe and cut it to get a length of 30-40cm. After that, take the insulation tape and wrap it around the pipe from a distance of 1-2 inches from its end. Wrap the insulation tape above the pipe in succession until it reaches a thickness of 4-5 mm. Next, do the same thing from a distance of 3-4 cm from the first wrapping. Next, take the copper wire, and after leaving some slack at the beginning, start wrapping it around the pipe. The wrappings should be tight and close to each other with no gaps between them. After wrapping the first layer, cover it with insulation tape, then start wrapping on top of it for the second layer. The copper wires should be wrapped side to side in the same direction, either clockwise or anti-clockwise. Repeat this process for 6-7 layers. For multiple coils, a spacing of 3 cm is required from the first coil. After preparing the coil, use sandpaper to sand the ends of the coil to remove the coating to make them conducting. Set up the bridge rectifier as shown in the schematic, I used a 600V D3SBA60 bridge rectifier. After looking at the marking on the rectifier wire, the AC pins of the chip to the live and neutral lines of your AC supply. 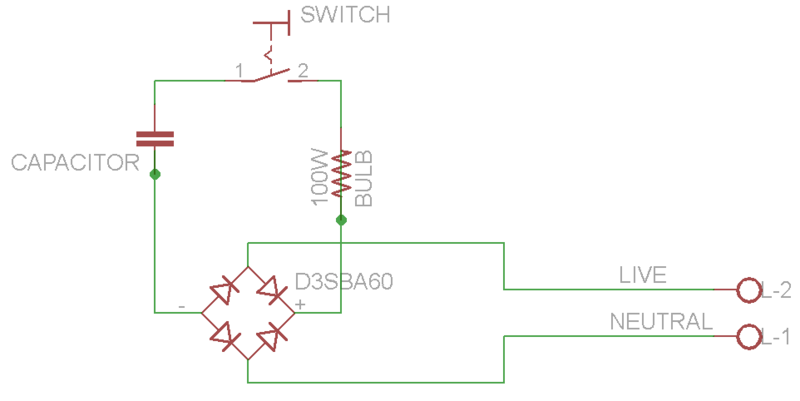 The + and - marked pins on the chip provide the DC voltage, the positive voltage passes through a 100W incandescent bulb acting as a high load resistor. A switch is used to toggle the charging of the capacitors on and off. When using multiple capacitors, always choose capacitors with the same rating and connect in them parallel to increase the current supplied. The coils on the coil gun have to be wired based on the schematic shown above. An SCR (Silicon Controlled Rectifier) or thyristor is used to control the high voltage supplied to the coil, it acts like a switch. I used a 50A rated stud type SCR, 50RIA120, smaller SCR's like the TYN616 can also be used if 5 or 6 of them are connected in parallel as each provides a surge current rating of 200A. Conventional switches or relays cannot be used since they usually burn the contacts in them due to the high voltage and current. The inner workings of an SCR are simple. 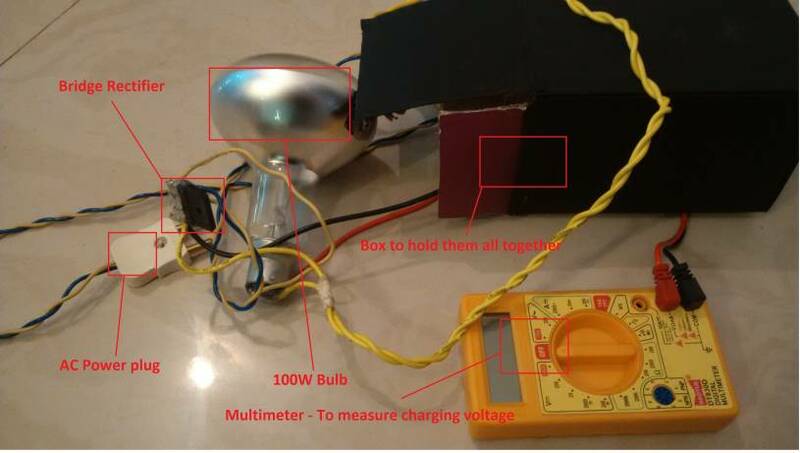 When a voltage is applied to its gate via a small battery, the diode is activated and the cathode and anode can be connected to the coil just like a normal diode. 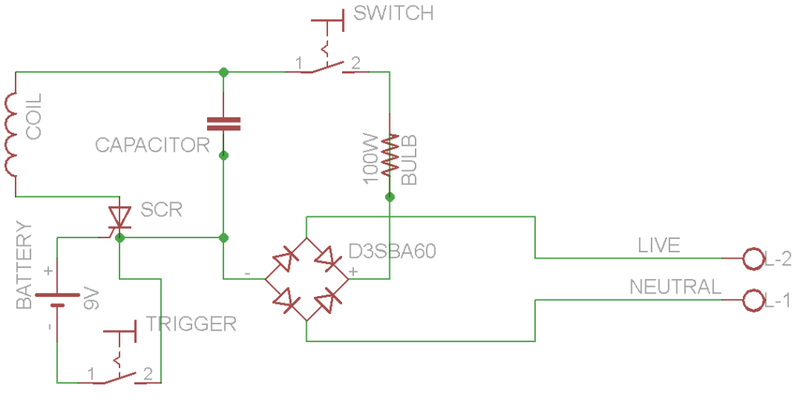 A switch that controls the gate voltage being applied to the SCR essentially controls the current going to the coil and acts as our trigger for the coil gun. Even if you have a lot of capacitors hooked up in parallel without an SCR capable of handling high current, you will not be able to supply the full power. High gauge copper wires should be used while connecting the capacitors and the coils. All connections and terminals should be properly insulated to prevent yourself from getting electrocuted. When choosing an SCR, choose one with a high value for "Surge Current/Itsm". The datasheet for this SCR can be found at: SCR Datasheet. 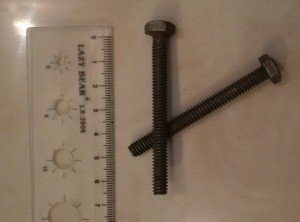 Any ferromagnetic material based object can be used as a projectile, usually, nails and bolts. I found using bolts to be the most effective, due to the greater surface area on their heads. In order to assemble all the of the coil gun's components together: the coil and pipe, capacitors, SCR, switch, etc, and of course make the whole setup look like a gun, I found a very easy way to do it. I was able to use a silicone gun (a holding apparatus used for silicone adhesive tubes). I took apart all the parts which were not required (the shaft, etc). Be careful when removing the spring as it is in high tension. If you're not careful removing the spring, it can jump off from its holding and hit you. Assemble the pipe along the length of the gun, fix it using some hot glue or other adhesives, arrange the SCR on the side and glue it. Tape the capacitor to the bottom of the gun and finally stick the trigger switch on the handle and wire the connections. Finally, use some black spray paint to detail it. A low power magnet like those found in tiny speakers can be used at one end of the pipe to hold the bolt or projectile in place so that it doesn't fall off while moving the coil gun. The Finished DIY Electric Coil Gun! This coilgun was extremely powerful, in fact, it smashed my window pane accidentally while testing it. It can pierce through foam, cardboard, etc, so be careful! You can see the coil gun in action in the video below! An interaction designer and engineer. Yahoo-Accenture had also awarded him as the "Most Promising Innovator".